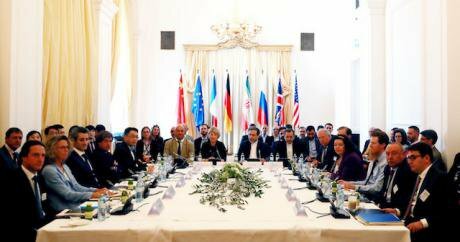 Representatives from six world powers and Iran attend a meeting on Iran's nuclear deal in Vienna, Austria, on July 21, 2017. Picture by Pan Xu/Xinhua News Agency/PA Images. All rights reserved. What is at stake when President Trump announces his decision on 12 May to stay or part with the ‘JCPOA’ (Joint Comprehensive Plan of Action) involves not just reopening old wounds and the renewed threat of proliferation in the Middle East, but also the prospects of another costly war in the region. What is also disturbing is the fact that an inexperienced American president should defy consensus opinion not just amongst his closest international partners but also amongst his own foreign policy community thereby subjecting regional and international security to wanton risks. It is ironic that the rise of ‘Iran Hawks’ in the US decision-making process should happen at a time when ideological radicals are but a minority in Iran’s ruling establishment with very little public support. While Trump’s persistent threats to renege on America’s signed obligations has been a god sent gift for reviving the fortunes of Iranian hard-liners, they have at the same time frustrated the economic promises of the Rouhani government and compromised his reformist agenda before millions of hopeful Iranians. The leaders of France and Germany have in recent weeks tried to persuade President Trump to look for new ways of augmenting the JCPOA while remaining faithful to a signed agreement that also includes Russia and China. While President Trump – perhaps eager to flex some muscles in advance of his impending talks with the leader of North Korea, remains ambiguous about his final decision; it is quite possible that in the end he will refrain from completely rejecting the JCPOA. However, from an Iranian standpoint there continues to be a huge gap between what had been promised and what has actually been delivered by the JCPOA. In reality, while President Rouhani is struggling to retain public support by attracting foreign capital and technology in order to resuscitate the country’s suffering economy, what is being discussed by Iran’s western interlocutors is at best clinging to an agreement which has not been fully implemented or at worst the prospect of new sanctions and ‘add-ons’ in lieu of scrapping the agreement altogether. It is no wonder that Ayatollah Khamenei, who has repeatedly voiced his distrust of American intent, should feel vindicated leaving such figures as Foreign Minister Zarif who had successfully negotiated the JCPOA in the lurch for having naively succumbed to a series of broken promises. It is now incumbent upon Europe - in line with initiatives recently proposed by the French president - with Russian and Chinese support to put matters right. Honouring the commitments made under the JCPOA – an agreement confined entirely to the nuclear issue – does not mean that there are no other areas of contention between Iran and the west such as Iran’s missile program or its activities in the Middle East. However, it is only right that they should be addressed in separate formats, independent of JCPOA. Providing Iran with incentives to remain inside the JCPOA in face of repeated US badgering, it will be possible for Europe to negotiate for a more comprehensive deal that includes extending the duration of the agreement. With regards to Iran’s missile program or its often referred to ‘bad behaviour or malign influence in the Middle East’, again all these issues can be raised provided due recognition is also given to all of Iran’s legitimate defence and security considerations as well as other priorities. For example, the independent European Central Bank or Central Banks within some key European countries may be induced to finding ways of bypassing continued American banking obstructions (in violation of JCPOA) by lending directly to companies willing to engage with Iran. It is well to remember that no local or outside power currently engaged in the Middle East can claim to have a monopoly on ‘good behaviour’. The carnage and instability in Iraq or Afghanistan or the on going civil war in Syria or the calamitous state of affairs in Libya were not instigated by the Iranian regime. Indeed the rise of ISIS in Iraq and Syria along with funding for radical Sunni elements who have callously murdered innocent civilians in the streets of Europe and America have been a product of bad behaviour on the part of some of the west’s closest allies in the Middle East who are now lobbying the US as well as Israel to start a new war with Iran. For its part, while it should remain faithful to the JCPOA, Iran also needs to understand that due to some of its past activities and current provocations, it continues to remain exposed to all kinds of allegations and at times unwarranted accusations. Its only tangible success in having extended its influence in Iraq, Syria and Lebanon and the corridor which it provides to the Mediterranean, if anything has been a consequence of American failures in these arenas. Iran, which can potentially exploit certain economic benefits from such an opening, has simply filled the vacuum left by miscalculated interventions on the part of the US and its friends. Nonetheless, there is a huge volition on the part of all the losers in the Syrian equation to dispossess Iran of its gains and dislocate its influence from the region. Finally, Trump’s continued robust criticisms of the nuclear deal in collusion with other anti-Iranian provocations sponsored by the likes of Saudi Arabia could also serve as a catalyst for another potentially explosive situation in the Middle East sparked by an all out ‘intended’ or ‘accidental’ conflict between Iran and Israel on Syrian soil with unpredictably catastrophic consequences. Europe in tandem with Russia and China must now act to avoid further conflict in the region by helping to preserve the JCPOA and the credibility of those who negotiated its passage with or without the US.